Dear Kimmy- My stops and starts look terrible, with big obvious lumps of thread that stick out like sore thumbs. What do you recommend as the best way of stopping and starting? Kimmy says- Great question! I use two different techniques for this and vary the technique depending on the quilt. For ‘busy’ quilts where the starts and stops can be easily hidden, quilts that will receive heavy use and require reliably sturdy starts and stops which will withstand multiple trips through the laundry, or quilts which will have an allover pattern where the appearance of the starts and stops is not crucial, I will stitch seven or eight little teeny tiny stitches all in a row. When I say teeny tiny, I’m not kidding. In this case, my stitches are only long enough to go over one or two threads in the fabric. To make these tiny stitches, I use a technique taught to me by the brilliant longarm quilter Shannon Hicks. Bring the bobbin thread to the top and hold the top and bottom threads securely between your fingers. Take one stitch, allowing the needle to make a full revolution and ending with the needle in the ‘up’ position. Tugging gently on the threads, use the threads to pull the fabric ever so slightly to the side, moving it only the distance of one or two threads. Take another stitch, again allowing the needle to make a full revolution. Tug gently on the threads, move the fabric slightly, take another stitch. With each tug, you are moving the fabric one or two thread’s distance, and with each stitch you are stitching over those threads, forming very small, very tight stitches. Continue until you have formed seven or eight stitches, then release the thread ends and position the needle so that you can begin to quilt at the last stitch you made. When you come to the end of your stitching line, you’ll do basically the same thing to secure the threads. However, since you won’t be able to tug on the thread ends this time, use your fingertip to press down gently on the quilt, again moving it only one or two thread’s distance before taking a stitch. These teeny stitches are very secure. (As a matter of fact, if you have to do any ripping, you’ll be cussing about how secure they are.) Like anything else, this technique will require a couple of test runs to get things right, but I think you’ll be very pleased when you see how unobtrusive the stops and starts can be when using this method. This needle has a side-loading eye, meaning that A. You don’t have to go find your magnifying glasses and a bright light every time you want to thread the needle and can instead thread it by simply guiding the thread along the side of the needle’s eye until it slips neatly into the notched opening and B. Due to the easy threading nature of the needle, you can use much shorter thread ends. This is especially useful when you find yourself in one of those situations where you know that once you start ripping out this stitching line, you’ll have to rip all the way back to a point where you can hide the merging of the old and new stitching lines. 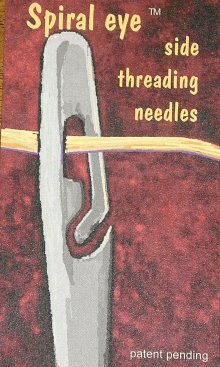 With this needle, you can work with much shorter thread lengths and still get good results, allowing you to do a lot less ripping. I just love less ripping. Examples of situations in which I would choose to bury would be design work using regulated stitching where little clusters of visibly smaller stitches would be quite obvious (especially straight line work like crosshatching, outline stitching around appliqué, quarter inch outlining, etc), when using a contrasting thread where every stitch is highly visible, when using thick or show-offy specialty threads, or when working on a quilt that is intended for competition. Regardless of which method you choose to use, remember that your stops and starts must be sturdy and secure because the last thing you want is to execute a stunning design on a beautiful quilt only to have the quilting start to unravel the minute your back is turned!